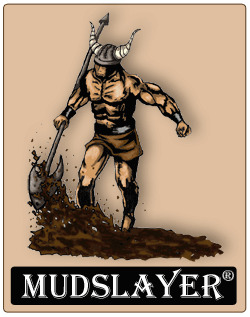 MudSlayer Manufacturing - Water Well Drilling Equipment Mudslayer Mfg. Mudslayer Portable Mud System built by a well driller for well drillers, saving their backs and their bottom line. This shaker system was designed by Jim LaPorte, professional water well driller in California for 30 years. Jim realized he needed a reliable mud system that did not require an enormous amount of training and extensive technical education to operate. Our unique dual screening system is dollar for dollar the best one on the market. The performance of post tension screens at standard screen prices. Our self cleaning tank design eliminates the manual shoveling, stirring and constant baby sitting of the pit. The Caterpillar power plant is quite, reliable and economical. We have a two axle towable trailer to move this unit easily and where it needs to go and electric brakes for extra stopping power. Four hydraulic outriggers come standard and make your setup quick and easy. The 500 G.P.M. lift pump is also mounted on a hydraulic boom to insure safety and reduce the risk of back injury. The unit comes standard with a 2" X 3" X 8 5/8" desanding and mudmixing pump. The drilling or charge pump is a choice of 3x4 mission magnum centrifugal pump or 4.5"x5" American manufacturing duplex pump for drilling most domestic wells or charging most duplex pumps.